Coming September 3, 2018. Run across the 4th longest suspension bridge in California! 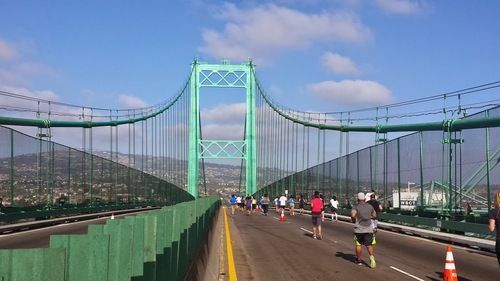 Conquer the Bridge has runners speeding out and back across the 36-story-tall, 1,500-foot-long, Vincent Thomas Bridge, which has been featured in many movies and television shows such as Charlie’s Angels, To Live and Die in LA, and CHiPs. The race is 5.3 miles long, and it’s a little challenging due in part to the inclines on the bridge but you are rewarded with sweeping views of the Los Angeles harbor on a car-free (yes, that’s happening in Los Angeles!) course. So this Labor Day, tie your running shoes on, slop on the sunscreen, and Conquer The Bridge!